They have been featured cover stories in various music and entertainment periodicals, and have performed on well over 100 released c.ds, and on international stages including Radio City Music Hall, Sydney Opera House, and Wembly Arena to name just a few. Numerous T.V appearances such as David Letterman, Jay Leno, Larry Sanders, Oprah Winfrey, VH1, Much music, CBC, and many others. 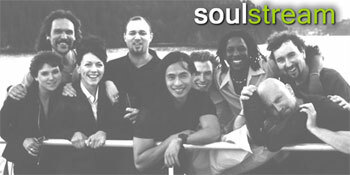 Various members of Soulstream have performed, toured, and recorded with artists including : Sheena Easton, k.d.lang, Wynton Marsalis, Tom Cochrane, Joe Williams, Mike Reno, (loverboy) Freddie Hubbard, INXS, Oliver Jones, Amos Garrett, Joe Lovano, Natalie Cole, Kenny Wheeler, Bo Didley, Heart, Renee Rosnes, Long John Baldry, Collin James, Taj Mahal, Dave Holland, Powder Blues, Maynard Ferguson, Slide Hampton, The Rankins, and on and on ...One member is even an artistic director for a music festival. The collective professional credits are far too long to list here. As a band they get together to, groove, create, and party! Their� repertoire includes anything that grooves : Herbie Hancock ,EarthWind & Fire, Prince, Tower of Power, Michael Jackson, Marvin Gaye,Incognito, Stevie Wonder, Barry White ...full song available. They have been regarded as the best band of this genre in B.C. (and some say all of Canada) ever since their� opening week at the Bar None. Well into theird 3rd year there, they have become a Vancouver funk/soul/jazz staple, what Tom Harrison of the Vancouver Province calls �Vancouvers� hottest House band.� They have their own approach to performing covers, which include improvising not just in instrumental solos, but as a collective, a process which has spawned whole new musical passages .... for a cover band, it is incredibly creative � Vancouver Sun. Noteable Entertainment & Events is a Vancouver based booking agency, party rental, entertainment services and event production company. If you are interested in booking Soul Stream please contact us.